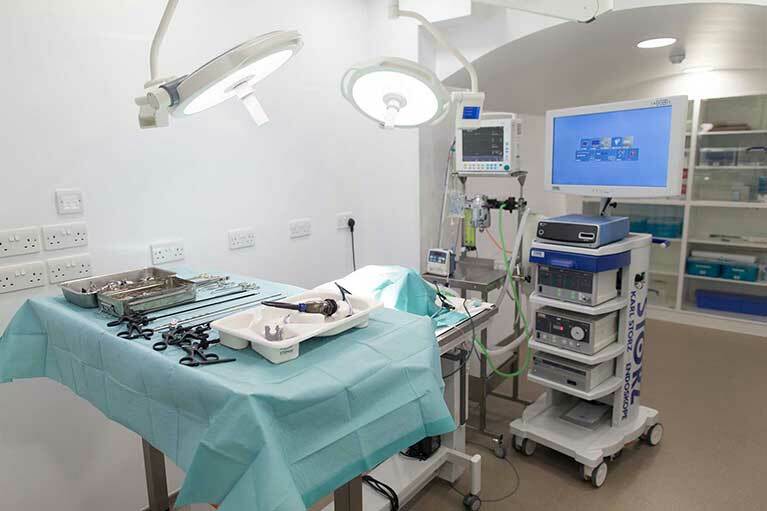 Our state-of-the-art operating theatre is well equipped with the most up-to-date instrumentation and surgical devices. The world-renowned Karl Storz operating tower is an excellent new system allowing us to perform cutting edge laparoscopic, thoracoscopic and cystoscopic procedures. The Image 1: SPIES system provides optimum clarity images for endoscopic surgery. The ergonomic and advanced DRE Pano Med OP tilting surgical table provides superior visualisation and access during minimally-invasive procedures and allows for optimal patient positioning to ensure the safest possible anaesthetic delivery. Top-of-the-line Medtronic energy devices allow for safe and efficient procedures to be performed, which minimises complications and maximises patient comfort levels. Surgical illumination is provided by state-of-the-art SLS900 LED, dual-mounted lighting. Our theatre team is supported by a full-time residency-trained anaesthetist with the back-up of an emergency and critical care specialist. All patients can be monitored with full multiparameter monitoring including invasive blood pressure measurement and ventilation should it be required. No other specialist surgery team can provide such advanced care within central London. Finally, we have sourced our surgical instrumentation from leading manufacturers across the globe, and this, together with our advanced theatre technology translates into an optimal patient experience.